Is calculus the loneliest branch of math? Functions describe an endless movement towards a limit but never an arrival, the destination mattering less than the rate at which it’s approached. J Carrier’s Elementary Calculus is an exceptionally well-constructed meditation on lonely anticipations. The photographs in the book describe Carrier's passages through Israeli streets, where he observes foreign migrants using payphones, presumably calling far-away homes. Elementary Calculus is not a study of migrants' experiences in any journalistic or sociological mode; rather, Carrier tethers the phenomenon – a repeated gesture, really - to his own perceptions, building a narrative around his subjects through which he describes isolation and alienation, and the possibility of connection. The photographs of people using payphones are set into a series of juxtapositions and sequences involving recurring motifs. Walls and fences appear throughout, cats moving over and across them more easily than people ever could. Birds, fruit and flowers occupy a landscape of stone, concrete, and telephone wires. Most of the pictures are made under a hot sun, payphones presenting little shelter. Despite the hard shadows, the pictures have a muted quality, both in tone and in volume, and the conversations photographed are quiet, murmured ones. 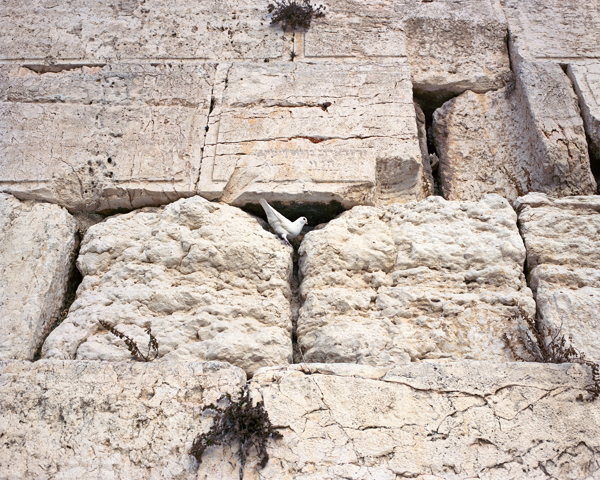 The coolest moments are enjoyed by a dove sheltering in the Western Wall, in pictures that bookend the volume. A series of photographs of a mechanical claw amusement game serves as a central metaphor of the book: the prizes are Israeli bank notes, surrounded by loose bits of rice and corn. It seems that it would be impossible for the grabber to pick up any of the thin bills, but the promise is there, and the slender opportunity. Around this sequence, the narrative ricochets gently between Carrier’s motifs, eventually leaving the city and suggesting a kind of redemption before returning to the phones, the dove, the Wall. There is no written statement or explanation to parse; aside from a minimal amount of text, including an epigraph by the Palestinian poet Mahmoud Darwish (“And your visions are your exile in a world where a shadow has no identity, no gravity. You walk as if you were someone else”), there is only the visual exposition. Carrier's economy in the selection of subjects delineates the space in which he develops his themes. The pictures perform multiple duties, functioning by turn descriptively, symbolically, metaphorically, and as part of the entire narrative system of the book. Carrier identifies the locales in which he photographs as Tel Aviv, West Jerusalem, East Jerusalem and The Dead Sea, recognizing the history of claims to Jerusalem and to the region. The book ends with a man praying at the Wall, followed by an unused payphone, its handset inverted in the cradle, and finally the above-mentioned dove. By creating a correspondence (in pose, in composition) between the praying man and the migrants, Carrier proposes that the tensions that he describes, the barriers and the longing, inform the experiences not only of the migrants but of all who have laid claim to the place. Though the role of the photograph as visual evidence is critical to the book’s success, Elementary Calculus does not draw its strength through documentary description, but through Carrier’s poetic argument. The tired expression on a woman’s face, the graceful presentation of two men sharing a handset in late afternoon light, the sequences of compositionally-similar views, and the deployment of words suggestive of calculation, found on discarded cigarette packs and clothing (“Time”, “Distance” and “Infinity”): all collaborate in aid of a larger visual narrative. The result is a book that stimulates a powerful human identification not because of the information that we glean from the photographs but because we come to trust Carrier's perceptions about freedom of movement, locally and globally, and of the precariousness of connections in the face of alienation. We are rewarded, when carefully exploring the book, with the experience of Carrier’s language coming together, of the visible becoming meaningful. This is a mode of photography that goes back to Robert Frank’s The Americans, and it’s always a pleasure when it’s accomplished well. Carrier doesn't show us any more about these subjects than he can himself apprehend, yet the photographs nonetheless provide a form of access, which feels intimate, to experiences that might otherwise be unknown.